I’m busy being in transit today, and then most likely furiously napping before heading out to the Mumford & Sons show tonight. In other words, there are no Halloween festivities for me this year, so last year’s costume* wishes you a happy Halloween weekend. Enjoy yourselves, kids. 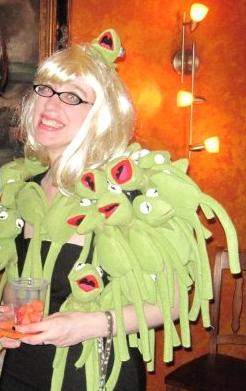 * Note, if you are ever looking for me Out and About, I am not actually blonde and do not actually wear a Coat of Kermits**. ** Note, the Coat of Kermits is entirely handmade. Take that, legions of people buying their Lady Gaga costumes at stores this year.